Founded in 1766 by James Christie, Christie's conducted the greatest auctions of the 18th, 19th and 20th centuries, and today remains a popular showcase for the unique and the beautiful. Christie’s offers over 450 sales annually in over 80 categories, including all areas of fine and decorative arts, jewelry, photographs, collectibles, wine, and more. Prices range from $200 to over $80 million. Christie’s has 53 offices in 32 countries and 10 salerooms around the world including in London, New York, Paris, Geneva, Milan, Amsterdam, Dubai and Hong Kong. Christie's also offers its clients worldwide access to its sales through Christie's LIVE™, its unique, real-time online bidding service. 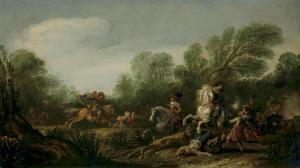 Jan Asselijn (Dieppe 1610-1652 Amsterdam) A military skirmish in a wooded landscape indistinctly signed and dated \‘[…]y[n] 163[? ]\’ (lower right) oil on panel 15 7/8 x 28 1/8 in. 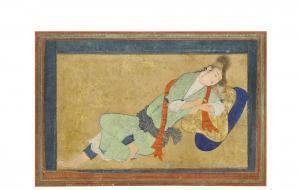 (40.3 x 71.4 cm.) Provenance Steffan Stackelberg, Faehna, near Reval (Tallinn), Estonia. 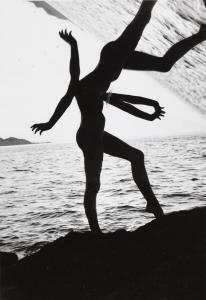 Anonymous sale; Sotheby\’s, New York, 5 November 1986, lot 43, where acquired by the present owner ($24,200). Antoine de Marcenay de Ghuy (Arnay-le-Duc 1724-1811 Paris) A silver-gilt ewer with other vessels, a gun, a basket of strawberries and a bouquet of flowers in a glass vase on a ledge with a pheasant above inscribed and dated on the reverse 'Ant. De Marcenay pinxebat. / Paris 1761.' (possibly copying a signature on the reverse of the canvas) oil on canvas, laid down on panel 31 5/8 x 39 ½ in. (80.3 x 100.2 cm.) Provenance Anonymous sale; Sotheby's, New York, 17 June 1982, lot 4, where acquired by Herman Shickman. Literature M. and F. Faré, La vie silencieuse en France: La nature morte au XVIIIe siècle, Paris and Fribourg, 1976, p. 299, fig. 481. Antoine Marcenay de Ghuy assumed a role of considerable influence in Paris artistic life in the 1770s and 1780s outside the confining worlds of official patronage and the Academy. Born in Arnay-le-Duc in 1724, he was recorded as living in Paris by 1755 and lodging in the Quai de Conti by 1757. An associate member of the Académie de Saint-Luc, the painters\’ guild that provided an alternative to the more prestigious Académie Royale de Peinture et de Sculpture, he participated in the Salon de Maitres Peintres in 1762, exhibiting a trompe-l\’oeil bas relief of 'jeux d\’enfants\’ in the manner of Sauvage (signed and dated 1762; Musée d\’Epinal). Such decorative paintings seem to have been something of a specialty for Marcenay de Ghuy (or Guy, as it is sometimes spelled), and other canvases of similar subjects can be found in the museums in Carcassone, Montbéliard and Toulouse and in several private collections. Although he continued to paint at least occasionally, he turned his attention increasingly to printmaking, reproducing paintings by Chardin and Rembrandt in beautiful and refined etchings, on which his continuing reputation rests. He also produced an important treatise entitled Idée de la gravure and a widely quoted essay of art criticism that adopted some of the aesthetic ideas of Rousseau and praised art that privileged visual and atmospheric harmony, a position somewhat at odds with the principal lessons and goals of traditional Academy pedagogy. In 1776, he was one of the principal organizers of the exhibition at the Colisée which served as a controversial \‘alternative\’ Salon for artists prevented from exhibiting at the official Paris Salon. The present painting cannot be identified with certainty in the livret of any of the exhibitions Marcenay de Ghuy participated in, but several include entries no more specific than \‘nature morte\’. It is a work of great delicacy which shares a refined sensibility with the still lifes of Chardin, an artist whose works Marcenay de Ghuy studied and reproduced in prints. 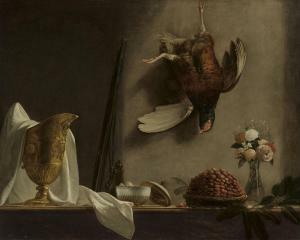 On a simple kitchen ledge the painter sensitively arranged the carefully chosen elements of his composition: a gilded ewer, partially covered by a white cloth; an open sugar bowl; a basket of wild strawberries and a glass vase with a beautiful bouquet of flowers; against the wall above rests a hunting rifle and beside it hangs a dead game bird. The painting, which is fully signed and dated 1761 on the reverse, is masterfully executed, beautifully colored and bathed in a gentle morning light that is authentic in its observation. The Shickman painting is, in itself, a skillful demonstration of the principals of unifying atmospheric harmony which the artist wrote of and encouraged in his important essay. The Master of the Osservanza ( Active in Siena c. 1440–80) The Dream of Saint Joseph tempera and gold on panel 6 3/8 x 5 in. (16.3 x 12.7 cm.) Provenance Félix Ravaisson-Mollien (1813–1900), Paris; his sale (†), Hôtel Drouot, Paris, 23 November 1903, lot 2, as Baldovinetti. (Possibly) M. Cheramey, Paris, 1904, as Sassetta. Mrs. Edwin S. Bayer, later Countess Sala, Paris; Galerie Charpentier, Paris, 19 May 1933, lot 20, as Sassetta and listing the subject as Saint Peter and the Angel. Samuel Henry Kress (1863-1955), New York. Jack Linsky, New York (1897-1982), 1956-1957. 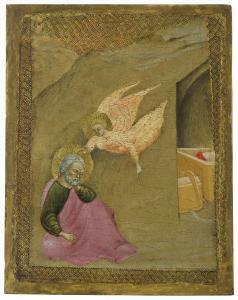 Anonymous sale; Sotheby's, New York, 21 May 1985, lot 136, as Sano di Pietro, where acquired by the present owner.